Blkskmr, boy do I understand needing to keep moving! The messabout is coming QUICK! And gathering folks to help, too. We found that four people can do the job. I'm so thankful for our little bunch of Appalachian Messers! The couple of times Summer Breeze needed flipping, they dropped what they were doing and scurried up the mountain to help out. 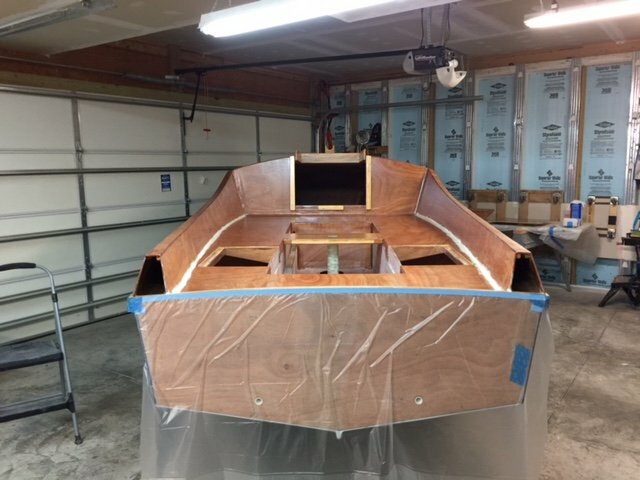 Will you be able to finish your boat before moving to the coast? If the boat is not mobile it stays. If it stays, I will be divorced. So yes it will be finished or I will be finished. Fairly simple. Get to work FAST. Forget food. Forget sleep. 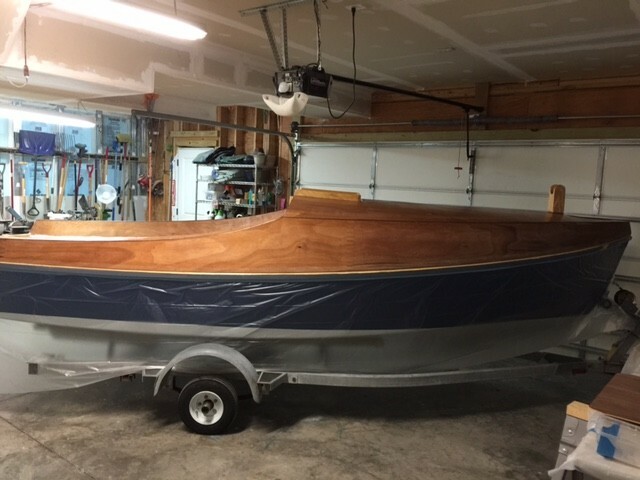 Forget EVERYTHING except finishing that boat!!!! The goal is progress not perfection. 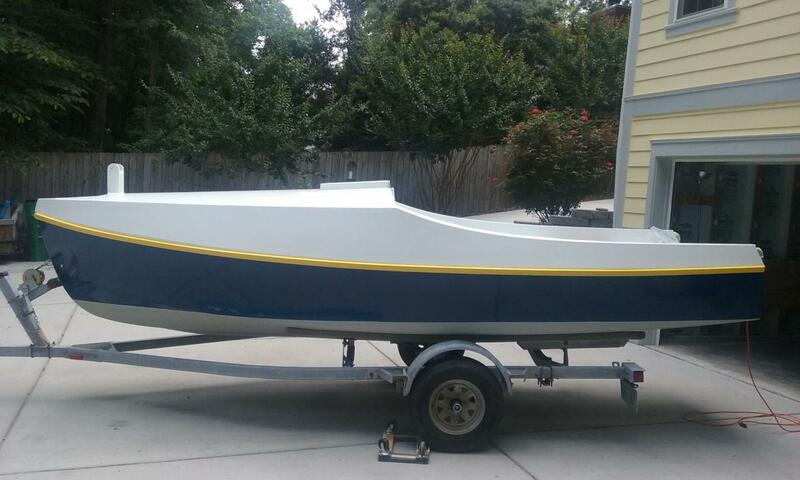 I need to set the bailers, do some odd jobs, and we flip the boat next weekend. Avocet is safely on her trailer. We will begin the final finish. Exciting times. now the real fun begins. Great news! I like the bright color blue. 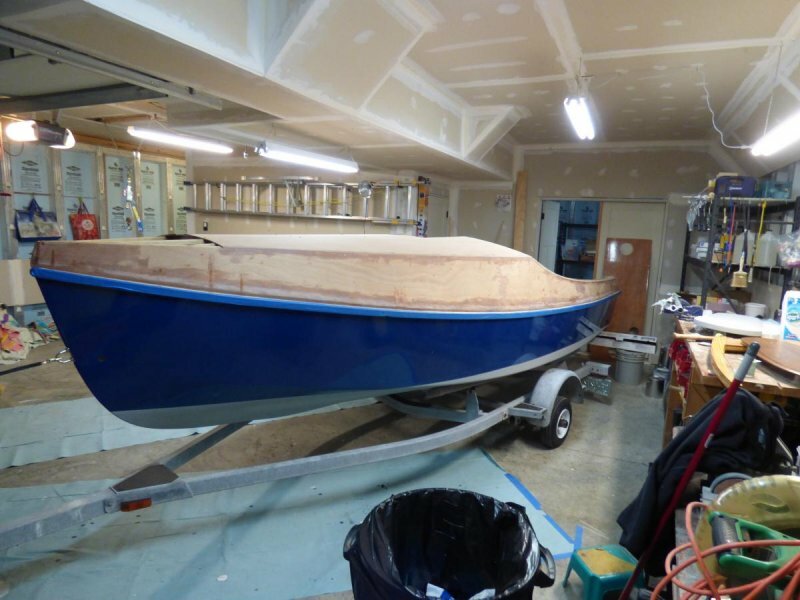 Did you stop the hull fiberglass at the gunnel? I was thinking on wrapping the glass up above the sheer but one thing about going slow is I'm learning from all of you. Steve. I brought mine over the joint between the sheer strake and hull. It took the place of taping the joint. I felt compelled to tape the hull/sheer seem. Once done, I felt OK putting the sheer strip on. I did glass up to the sheer strip. I think I will glass top of cabin house and down about two inches. I will then tape remaining seems. 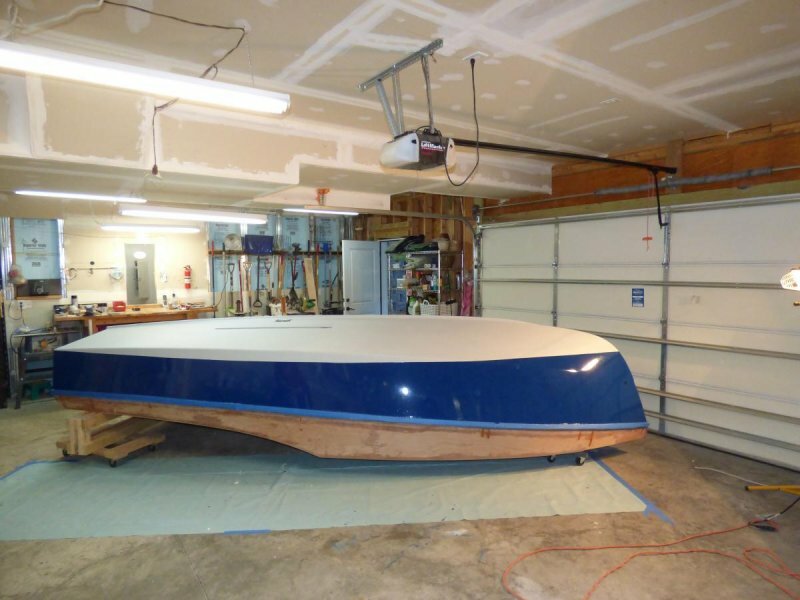 Everything will receive the minimum of 3 coats of epoxy, primer then paint. I have looked forward to getting to this point for months. 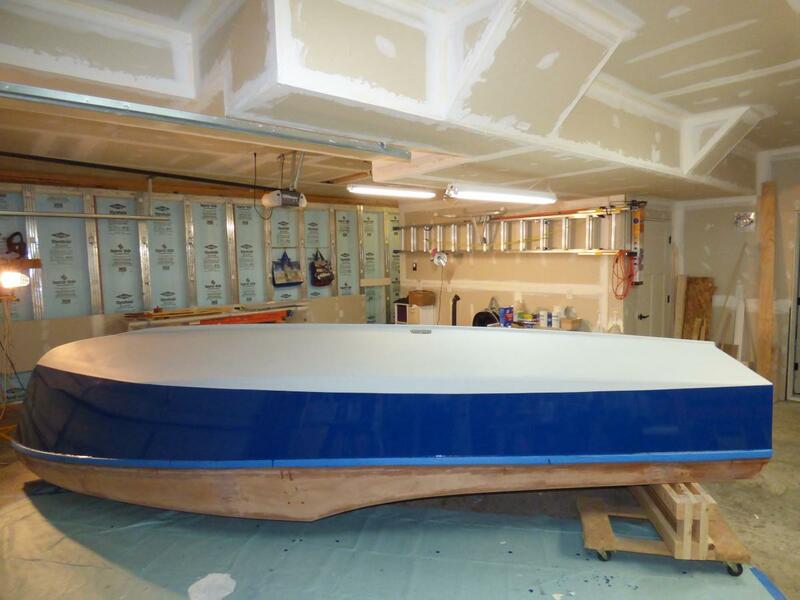 I have ordered sails, requested deck hardware layout so am, I hope, in the short rows. If nothing else, I can visualize the end. I figure I will be finished between June and August. Now that the boat is on a trailer and mobile, I can breath easier. I'm a sucker for a blue boat. She is gorgeous! Take lots of photos at the messabout next weekend. You should have at least three Mk III's to look over. Wow! I really love the blue color!!! But they are already blue. I think the colors turned out nice, but unfortunately the finish and painting are amateurish at best. Such is life. But it is ready to move which was the real goal. I hope to finish by end of August. Good job. Very pretty colors. Keep the pictures coming as you finish. Y'all think she will be done by the end of August? I love the colors too! Keep going at it, Richard, you'll get there! 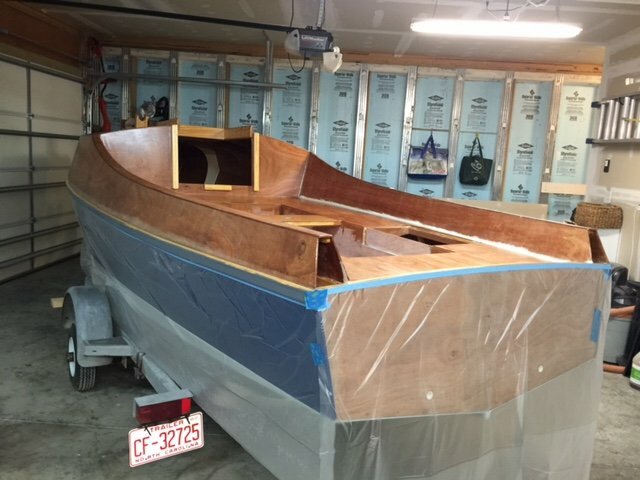 It has taken a long time but the hull(#6) and spars are complete. We took the boat for a test motor this last weekend, filled the water ballast and emptied it. Only a small drip from bottom gudgeon which was an easy fix. 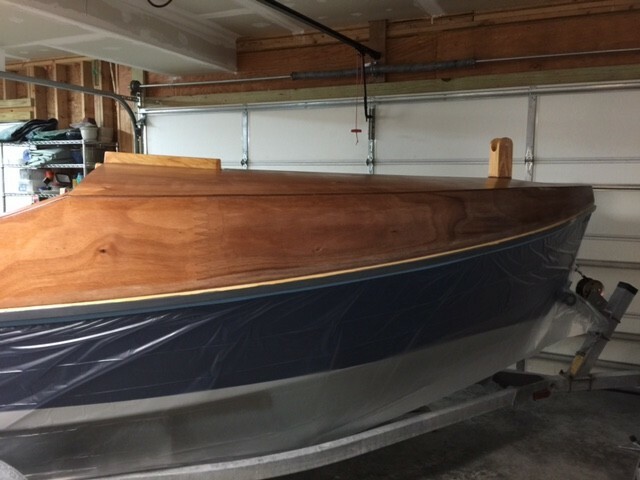 If all goes well, we will sail this weekend. It has been two years, three houses, two job changes, three sanders, acres of sand paper, and cases of rubber gloves. 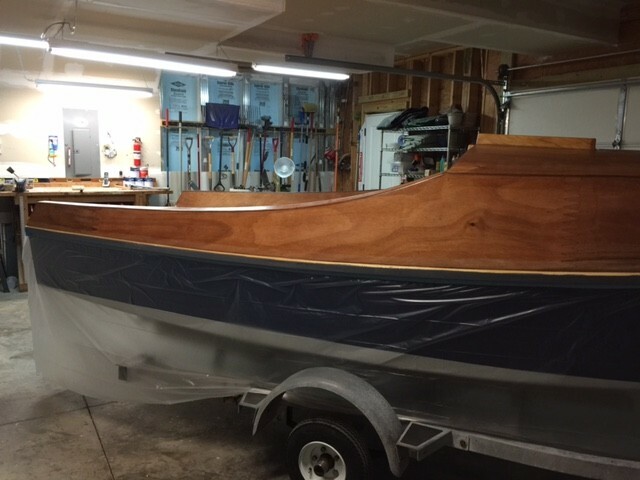 ( and we need more rubber gloves now) Most important, without my wife's hard work, patience, opinions, and sound advice, this boat would not be complete. She has been a willing co-conspirator. Congratulations, Richard and Michele! You finished her just in time for spring. 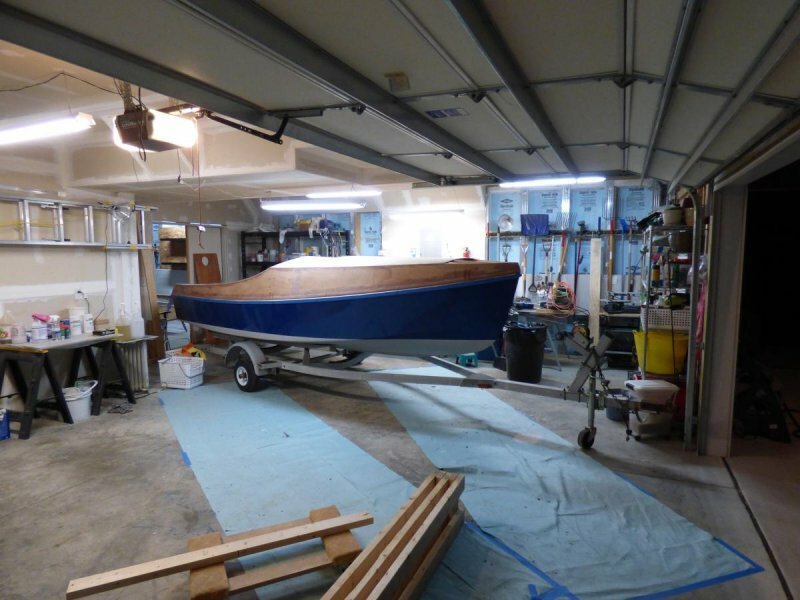 Now you have a whole sailing season ahead of you. More photos, please!